REVEL Rockies is excited to offer a wide range of vendor opportunities that provide access to a highly-targeted demographic at a very low cost. Pricing has been kept low in order to ensure accessibility. The sixth annual REVEL Rockies expects 3,000 participants and a crowd size over 6,500. Booth maps. Booth space is reserved on a first-come first-serve basis. 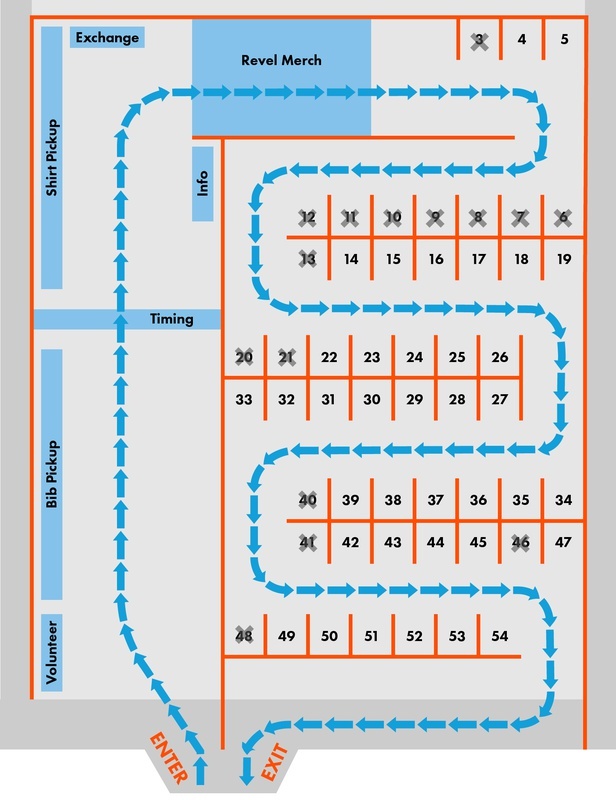 Maps of booth space available at the expo and the finish venue is forthcoming. Expo. The REVEL Rockies Expo will be held at the Steinhauer Field House on Saturday, June 1, 2019 from 10:00 AM until 6:00 PM. The Field House is located roughly 7 miles from the finish venue at 13th and Maple Street on the School of Mines campus in Golden, CO. Additional details including setup and our expo service kit will be emailed once payment is received. Finish line. The finish line is located at Morrison Park in Morrison. Setup time for booth space at the finish line is from 5:00-6:30 AM on Sunday, June 2, 2019. The event will conclude around 12:00 PM. Additional details will be emailed once payment is received. Swag bags. We offer physical race bags. Items must be received no later than May 20, 2019 to be included in the race bags. Additional information including ad specs and requirement will be emailed once payment is received. The Vendor agrees that once received, payment is final and may not be refunded for any reason, including the vendor’s inability to attend or missing deadlines for the provision of swag bag items. The Vendor understands that the use of the name REVEL Rockies, REVEL Rockies Marathon & Half, and/or any of their affiliated logos, is prohibited without express written consent. The Vendor, on behalf of himself/herself and on behalf of the Vendor’s personal representatives, assigns, heirs, and executors, hereby fully and forever releases, waives, discharges and covenants not to sue Brooksee LLC, the School of Mines, the Colorado Department of Transportation, the Colorado State Patrol and its officers, Clear Creek County and its officers and elected, Jefferson County and its officers and elected, the town of Morrison and its officers and elected, Bandimere Speedway and its officers and employees, or Hannay Realty Advisors, and any other sponsoring or co-sponsoring companies, individuals, and volunteers related to the Race (collectively, "Releasees") from all liability to the Vendor and his/her personal representatives, assigns, heirs and executors, for all loss(es) or damage(s) and any and all claims or demands therefore, on account of injury to the Vendor or property or resulting in the death of the Vendor, whether caused by the active or passive negligence of all or any of the Releasees or otherwise, in connection with the Vendor’s involvement with the Race. The Vendor hereby assumes all risks of loss(es), damage(s), or injury(ies) that may be sustained by him/her during his/her involvement with the Race. The Vendor warrants that all statements made herein are true and correct and understands that Releasees have relied on them in allowing the Vendor to be involved with the Race. The Vendor understands and agrees that in consideration of being permitted to be involved with the Event, you and any registered party, the heirs, personal representatives or assigns of you or the registered party do hereby release, waive, discharge and covenant not to sue Releasees for any and all liability from any and all claims arising from participation in the event by you or any registered party. By indicating your acceptance of this agreement and waiver, you are affirming that you have read and understand this agreement and waiver and fully understand its terms. You understand that you are giving up substantial rights, including the right to sue. You acknowledge that you are signing the agreement and waiver freely and voluntarily, and intend your acceptance to be a complete and unconditional release of all liability to the greatest extent allowed by law.